I was not raised eating healthy, knowing how to grow my own food or gardening. These are skills I’ve had to acquire as an adult. And, it’s been rather intimidating at times, but I’ve taken classes at the local organic nursery, read books, watched Youtube videos and generally invested the time to learn. Growing your own food is a powerful way of taking control of your health and finances. Saving your own seeds is like printing your own money. That’s why Monsanto patents his seeds: so that farmers have to buy their seeds year after year instead of saving their own. 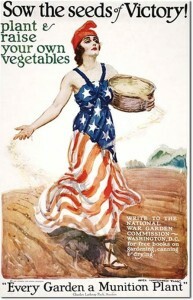 During WWII “Victory Gardens” were encouraged to prevent food shortages caused by war rationing. After the war, big food companies went on massive PR campaigns to get people to buy their convenience foods rather than growing your own food because the profits went into their pockets rather than people being self-sufficient and growing their own. There is nothing like eating a tomato with fresh basil and oregano from your own garden, knowing they are all organic and what nutrients you put into the soil. And eating your own peaches and strawberries that taste wonderful. Or blueberries that were FREE. Planting perennials is a wonderful investment because they do not have to be replanted every year. And saving seed is a great way of saving money each year on annuals because you don’t have to keep re-buying seed each year. Invest in your gardening skills and health by educating yourself progressively each month and year…gardening crosses all ethnic and age barriers and is truly a uniting and empowering activity to do.